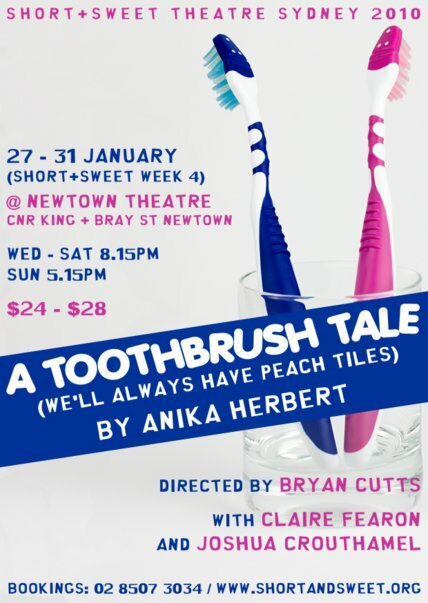 Yep, in the terrific lead-up to the presentation of ‘A Toothbrush Tale (We’ll Always Have Peach Tiles)’ by Anika Herbert, the wonderful Pink Toothbrush (Claire Fearon) and Blue Toothbrush (Joshua Crouthamel) have thrown themselves into rehearsals with tremendous vigour. What started out as a delightful little comedy if now a full-blown melodrama of pasty proportions! To be a part of this event, visit the Facebook page for this production.